The traditional definition of pilgrimage is a journey, especially a long one, made to some sacred place as an act of religious devotion. Hence, as Christians we have come to understand pilgrimage as a journey, to a specific place like Israel or Assisi, Italy for a time of worship / devotion. As a part of my personal pilgrimage here on earth I plan on visiting both places. However, when I read the Gospel for the Third Sunday in Easter (Luke 25:34-38) three thoughts jumped out at me as refreshing revelation into what actually lies ahead for the Christian pilgrim. First, as Catholics we believe that the Real Presence of Christ (in a mysterious way) is present in the Holy Eucharist. This is something I was aware of prior to becoming Catholic and a theological truth that I accepted prior to my conversion. However, when I re-read, “The two disciples recounted what had taken place on the way, and how Jesus was made known to them in the breaking of bread” I was encouraged that the resurrected Christ chose to reveal Himself to the disciples through the “breaking of the bread.” This picture is not only a reaffirmation of what Christ said (& taught) in John 6:53-59 but is an encouragement to us earthly pilgrims – that we can actually reside in the presence of the resurrected Christ and draw our strength from and be in union with Him. Second, Luke describes another encounter Christ had with his disciples when he recounts these words, “Look at my hands and my feet, that it is I myself. Touch me and see, because a ghost does not have flesh and bones as you can see I have.” This invitation to touch and see is quite important as it affirms the reality of life beyond the grave. 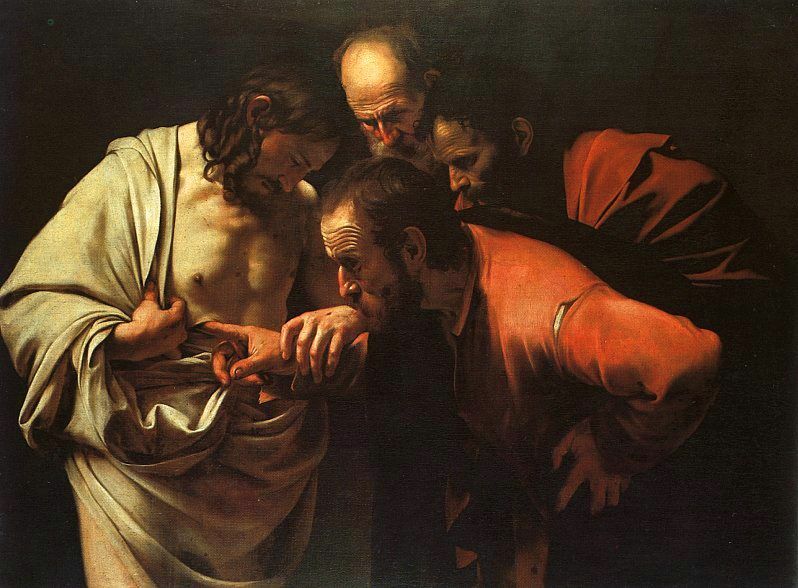 This post-resurrection account of a physical Christ inviting the disciples to touch his flesh so as to enlighten their understanding and strengthen their hope that union with Christ is our ultimate destination and a physical reality. Finally, Christ presented to these pilgrims an act of great mercy. As Luke recounts, “He opened their minds to understand the Scriptures.” See, what the disciples actually encountered was so real and yet other-worldly he wanted to ensure they understood this experience to be more than just a vision or dream. Hence, he opened their minds to see that what they experienced was foretold in the stories throughout sacred scripture. Christ created a connection between what they had been taught, what they were expecting (in Messiah), and what they had actually experienced. Now I hope we believe. May we find ourselves in His presence when our journey ends. Thanks, Eric. It is my strongest image, captured by the artist Caravaggio, the revelation of Christ at the end of the 6 mile pilgrimage to Emmaus. And as we broke bread and shared in the Eucharist recently it was exactly that moment I recalled – the reality of Christ in both bread and wine to the humble yet faithful follower of the Triune God, Father, Son & Holy Spirit. Be nourished in your faith today and be blessed as a household of the faithful.